Tom began his sports writing career in 1952 as a 17-yr old junior at Tucson High School. He was one of the two original correspondents hired by the Arizona Daily Star to help with high school sports coverage. The Star hired him fulltime in 1953 after he graduated from THS. As a writer, photographer, and editor, Tom reported on all aspects of sports in the community from high school to the University of Arizona; from professional golf and bowling to rodeo; from Cleveland Indians Spring Training to the old Tucson Cowboys of the Arizona-Texas League. He served as sports editor between 1970 and 1978 and returned to the Sports Department in 1986 after a stint as Community Affairs Editor. A lifetime Tucsonan, he currently covers the outdoors as editor and columnist, as well as filling in as reporter/worker in other areas, particularly Golf, Bowling, and Rodeo. 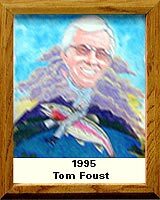 Tom’s work has been honored by numerous organizations including the American Association of Collegiate Baseball Coaches in 1959 and 1960, the Arizona Press Club in 1963 and 1973, the Arizona Wildlife Federation in 1981, the Arizona Fish and Game Commission in 1991, the American Bowling Congress in 1991 and 1993, and the Pima Trails Association in 1994. Among his many activities and achievements, Tom has helped raise over $1.5 Million for the Southern Arizona Daily Star’s “Sportsman Fund” to benefit more than 30,000 Tucson and Southern Arizona youngsters.